As more and more marketers adopt agile marketing, there has been a shift in the way marketing campaigns are planned and managed. Agile project management is modeled on the agile software development philosophy and focuses on agility, adaptability, customer focus and shorter planning cycles. With this new philosophy, marketing teams need to adopt a more streamlined planning cycle to achieve their marketing objectives. In this post, I’ll tell you a little more about how we at Brightpod structure our planning cycles to adhere to agile marketing principles. So here you are, a step by step guide to agile project management for marketers. This entire cycle described here is for a single project. For instance, it may be for re-branding a business unit or it may even be an SEO project for a client. Setting a vision for the project is the first step towards planning it. A vision should define the objectives of the project/campaign and the targets that are to be achieved as part of the campaign. At Brightpod, we use milestones to link the vision to the tasks for that project. This helps us plan tasks keeping the mission in mind. At the roadmap stage, teams should lay down the broad level stages of the campaign/project. This ensures a holistic view of the campaign and everything that needs to be accomplished. 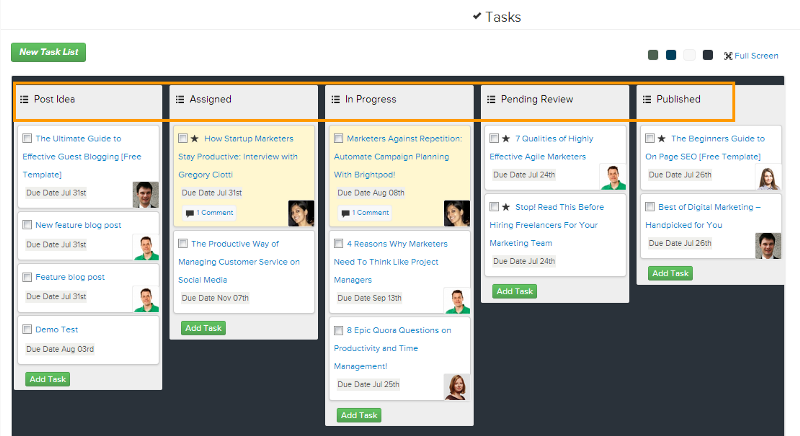 At Brightpod, we add task lists as our roadmap. For example, for a content marketing campaign our roadmap would look something like this (highlighted in orange). This exercise is ideal for marketing projects that are continuous in nature or take relatively longer to show results such as SEO campaigns or content marketing campaigns. In sprint planning, each ‘sprint’ is a planning exercise for one part of the entire project. For eg. with a content marketing project, one sprint could be entirely dedicated to setting up a blog, one could be for brainstorming content ideas, and ongoing sprints for regular content creation, promotion and lead generation. During sprint planning, the team can expand the roadmap and add detailed tasks for each broad level task outlined during the roadmap. Here tasks are added and assigned to team members to give everyone an idea of what they need to accomplish. A daily SCRUM i.e. daily standups are an essential part of agile project management. As part of a daily SCRUM, team members get together everyday to discuss all the tasks they did the previous day and the tasks they’ve got lined up. This way, everyone on the team stays in sync and any roadblocks can be quickly dealt with. Now as a remote team, we can’t always have standups in person. To combat this, we use Brightpod to make sure we all stay in sync while planning our own projects. 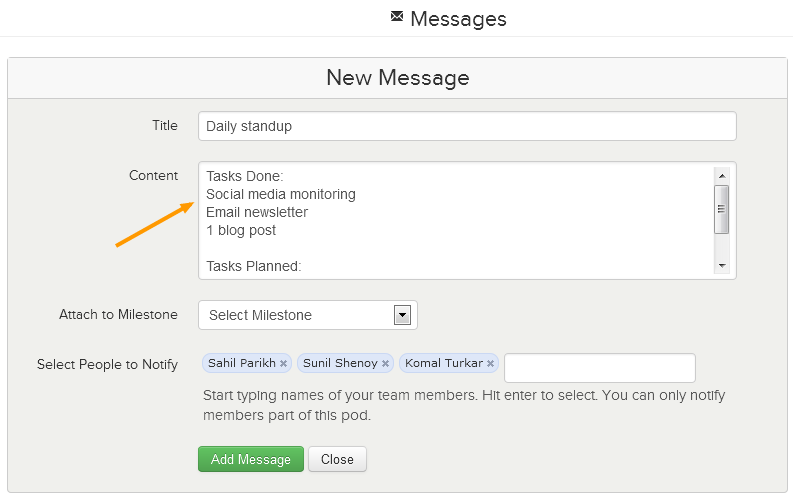 Well, Brightpod has some neat collaboration features that let us message the rest of the team and comment on tasks. We all send out a message every morning to the rest of the team letting them know what we’ve accomplished and what we’ve got planned for the rest of the day. Apart from this, we have detailed meetings every Monday and Friday to talk about the tasks we’ve got planned and the results of all the tasks we’ve accomplished. At the end of each ‘sprint’, a great exercise to conduct is a sprint review. Like the name suggests, the idea is to break down all the tasks that were completed as part of the sprint and review their effectiveness. This exercise is really the basis of agile project management as it shows you what works and what doesn’t thereby allowing you to pivot if necessary. So there you have it, a quick and easy guide to help you and your team get started with agile project management. What about you? 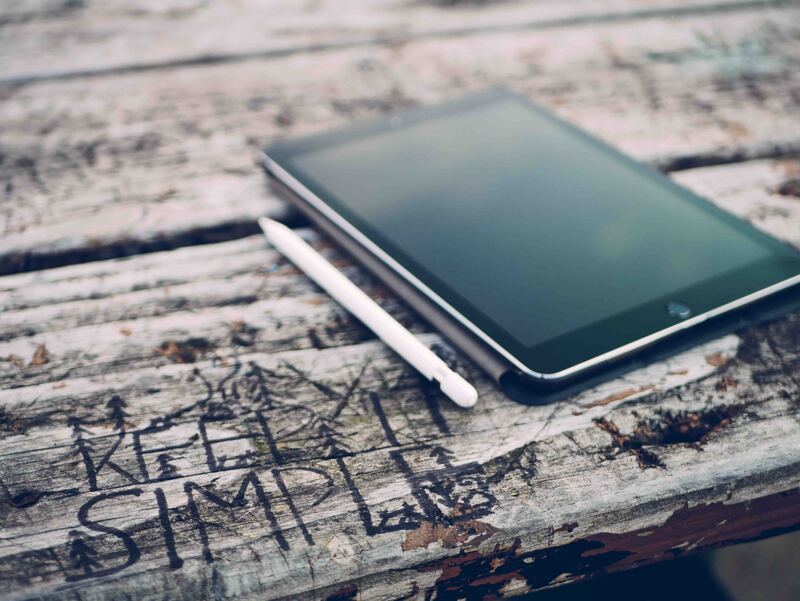 Have you adopted agile marketing yet? If yes, then how do you manage projects and campaigns while adhering to agile principles. I would love to hear your take so do leave a comment below!